Post-representation cartography is an approach to mapping which emphasizes the processes involved in map-making. The emphasis shifts from “the ‘rules’ of map design and techniques of cartographic production, and/or documenting and deconstructing the underlying ideologies and agendas of maps, to a processural perspective concerned with how mappings and cartographic design, technique and ideology emerge time and again through a plethora of practices framed within a complex discursive and material context, and the diverse, unfolding work of mappings in the world” (Kitchin et al., 2013: 481). Thus post-representation cartography is concerned with how representations of the worlds around us become maps through, on the one hand, the use of certain technologies, tropes and methodologies by cartographers (in the broadest possible sense), and on the other hand, how users unfold and recognize maps anew through their style, content and conventions. In some contexts, something which isn’t traditionally thought of as a map, may thus become one because it is used as a map. In this way maps become “writerly texts” where the “purpose is to see texts as producing an open series of readings, each of which requires that the reader also be in part author of meaning” (Pickles, 2004: 174). The map you see here is the result of a project with skateboarders to understand their appropriation of space in Tyneside, in the North East of England, undertaken in 2009-10. Our primary methodology was to ask skaters to map their worlds, but what we actually got were fascinating sketches and doodles full of insight and emotion. 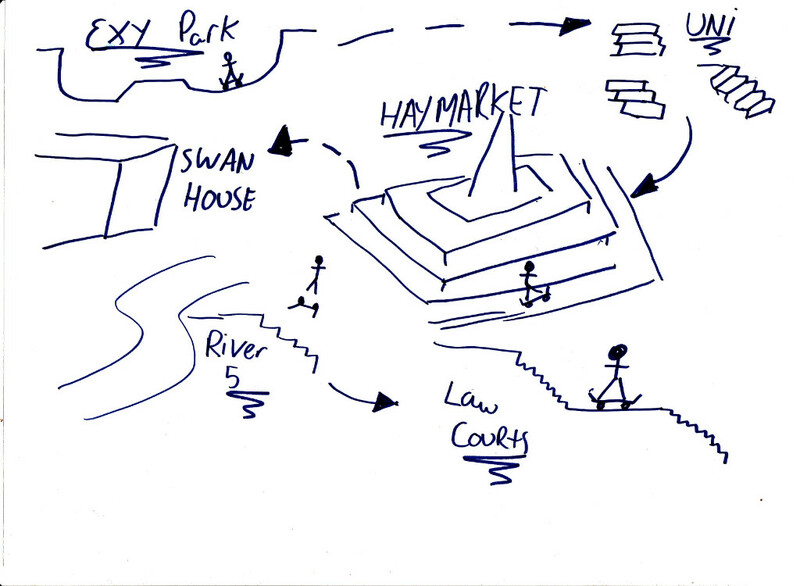 In a previous piece we have explained how these sketches and doodles became maps through our analysis and use as locational technologies, and were subsequently aggregated into the map you see here (Swords & Jeffries, 2015; see also Jenson et al., 2012, for insights into the activities of skateboarders). In what follows, we adopt a post-representational approach to explain how the map has unfolded to take on other forms through its use in a variety of contexts. 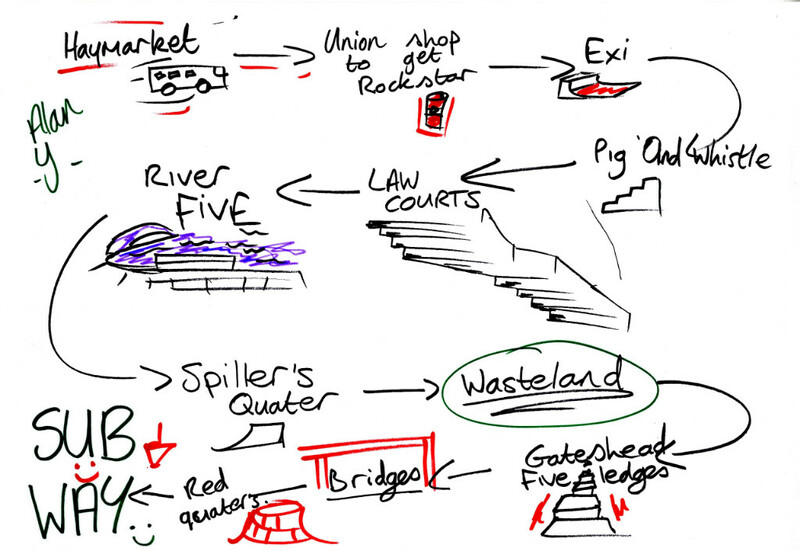 We originally created the mappa mundi of Tyneside’s skate scene to give something back to research participants and avoid an extractive research process. We’ve given out hundreds to skaters, their parents, friends and other interested parties. The skaters are mainly male, under 25, and include locals and students. There are older skaters who lend experience and building skills to help improve spots such as the Wasteland. We further involved skaters in the project by giving them the opportunity to exhibit their photography and video-making alongside maps from the project in an exhibition. In this gallery context the map changes function from a tangible “thankyou” to artwork, and thus the kind of interaction with it shifts, too. The map becomes an object of beauty and contact, countering the portrayal of skaters as unruly, their world hidden from public view. The content of the map is also seen in a different light as the exhibition took place at Dance City in 2010, a publically funded cultural institution with a curatorial role that legitimizes the work it shows. The skateworld of Tyneside, then, is not only made “official” in the production of a map by academics, but also in the context it was displayed. It thus becomes a political device that implicitly criticizes “authoritative” maps of Tyneside, which exclude people such as skateboarders. The physical existence of the map explicitly counters the city centre maps, which focus on either decorous heritage or contemporary consumption. The map created an opportunity for skaters to represent and eulogize their world, giving them permission to be proud. This was demonstrated as skaters showed their parents what they had contributed and the spots they went to around the city. Exploratory processes such as this one also illustrate the role of the map as something to examine and learn from. 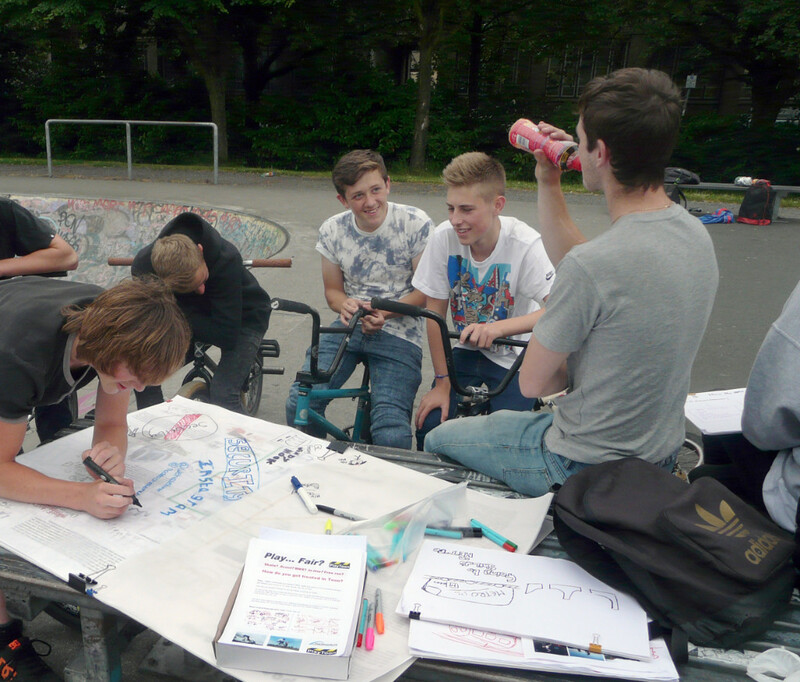 We learnt the social dimensions of skate spots, the journeys skaters take between them, and how they are valued within the community. Skaters shared with us stories and legends of tricks of the past, and the temporal and spatial rhythms of their world. We heard of the old lady who felt safe when skaters were around, the deal between skaters and security guards at the Law Courts for access after work, and the dangers of jumping Leazes 13. 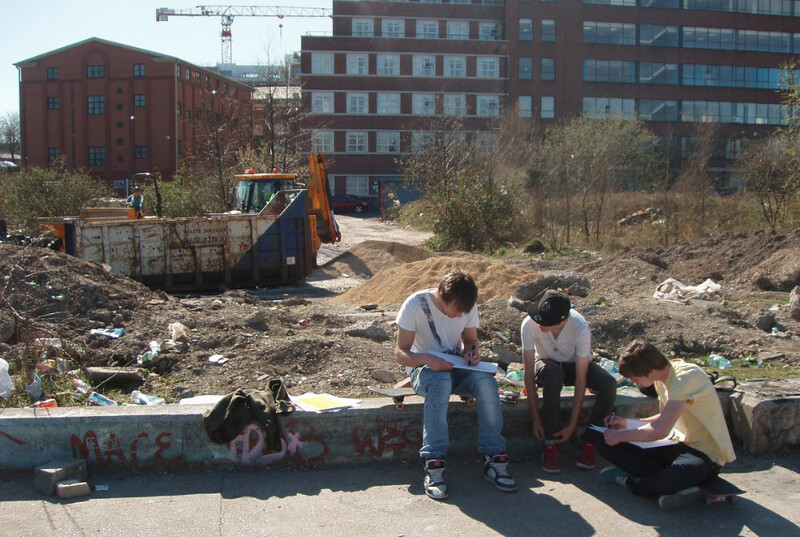 The skateboarders discovered new spots, each other and the fact that people value their presence in the city. Like many other maps, its “mapness” means it functions as a historical record of the skate scene. The Wasteland, Leap of Faith and Library Plaza no longer exist as the buildings they were part of have been knocked down and redeveloped, so this map is the only “official” record of their location. The map was never designed as a navigational tool, although it would help to find spots, and its historical dimension adds an element ofremembrance. The map’s mapness has allowed it to be mobilized in a series of other contexts. It has become desirable and useful for skaters who weren’t involved in the original research. 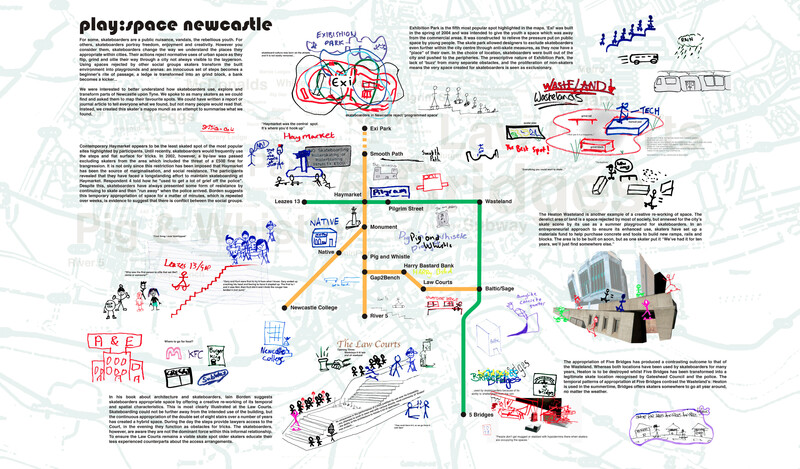 Skate scenes are very visual, and this map has become part of the scopic regime of Tyneside’s skateboard community. The existence of the map is an immediate, visible explanation of what we do, its visibility inviting more skaters to join in. As our work has continued, we give out the map to participants, and it incentivizes them to take part. It shows them we are serious about them and their place in the city, and they can show others that institutions like universities are interested in their lives. Its visual style adopts tropes from other maps of Tyneside with the curve of the river on the background layer recognizable to anyone familiar with the area and the green and yellow lines connecting skate spots reflect the design and colour of Tyneside’s Metro light rail system. Even skaters who weren’t part of the original project have been exposed to it and recognize it when we use it in fieldwork. It thus acts as a calling card when working with new participants who have often heard, or seen our work. As our research has continued we have worked with other urban sports groups. The photograph to the right shows BMXers tracing their world over the skaterboarder’s city. The map again shows this new group we are serious about them, and offers them an opportunity to counter what to many would be seen as a similar appropriation of the city. What is revealed in the BMXers version, however, differs in a number of ways. The most obvious is the larger territory BMXers can access in a day, their bikes enabling them to venture further afield. The scale of the spots BMXers appropriate is also larger. The size of BMX bikes and the greater speeds they are able to achieve requires long runs ups and outs to perform tricks safely. The skate maps have also facilitated responses even in formal gallery settings where no annotations were requested. In the photograph below you can see our work exhibited at Dance City in 2014. 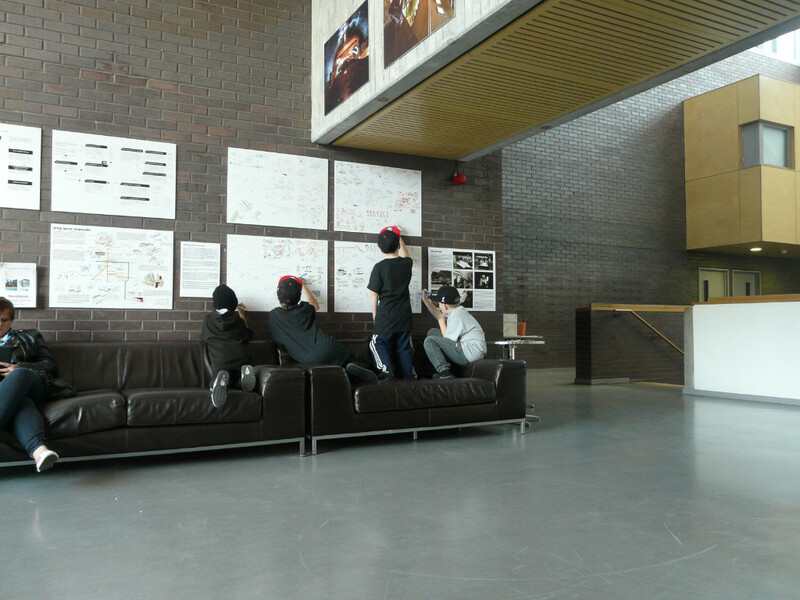 A breakdance festival was being hosted in the venue, and a group of dancers aged 8 or 9 added themselves to the maps on display. This was a delightful surprise and indicates the map does work by itself to engage young people in mapping their city. The children pictured felt comfortable to subvert the conventions of display to engage with the mapping process. Away from fieldwork, the map also legitimizes us as researchers in meeting with potential new backers and research partners. 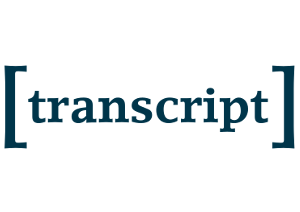 We can show a tangible, interesting output from a previous project which fascinates people in a way an executive summary or journal article can’t. Here the map maintains its role as an explanatory tool, but it also works to show what we’re capable of producing. Its mapness again helps here as the process and product are made visible, which encourages partners to explore what they would like. To conclude this brief biography of this map, we have tried to trace the different forms it takes as it unfolds while people use, edit and re-inscribe it with meaning. It has become a locational tool, a historical record, artifact, work of art, calling card, a thankyou, an agent in itself and a prompt for discussion and exploration. It has taken on these forms in a variety of sites, including the places it depicts, within cultural institutions, universities, imaginations of viewers and now in an atlas. It has been unfolded and refolded to become a legitimatizing tool for us as its original authors as well as for skaters and others as they re-inscribe it with new meanings. Now, in its current context, we hope you, the reader, will find your own meaning in it. Jenson, A., Swords, J. 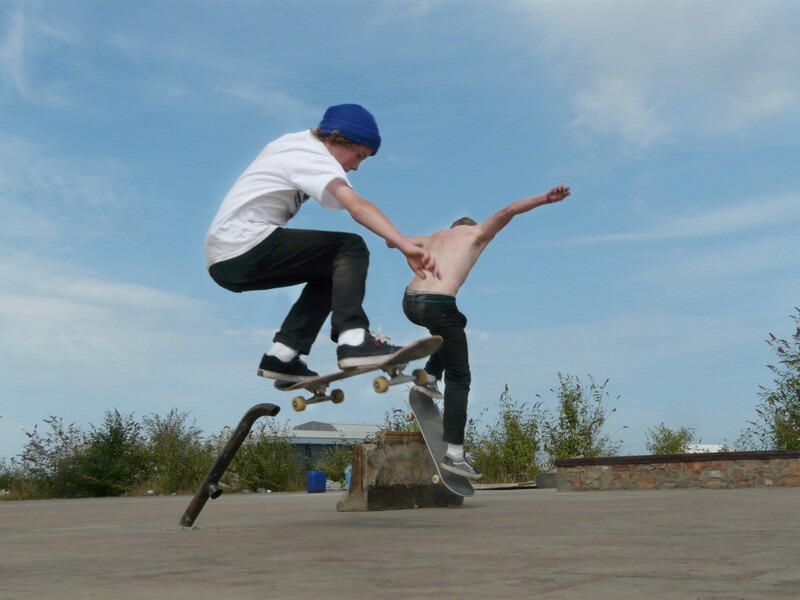 & Jeffries, M. 2012.The Accidental Youth Club: Skateboarding in Newcastle-Gateshead. Journal of Urban Design, 17(3): 371–388. Kitchin, R., Gleeson, J. & Dodge, M. 2013. Unfolding Mapping Practices: A New Epistemology for Cartography. Transactions of the Institute of British Geographers, 38(3): 480–496. Pickles, J. 2004. A History of Spaces: Cartographic Reason, Mapping and the Geo-Coded World. London: Routledge. Swords, J. & Jeffries, M. 2015.Tracing Postrepresentational Visions of the City: Representing the Unrepresentable Skateworlds of Tyneside. 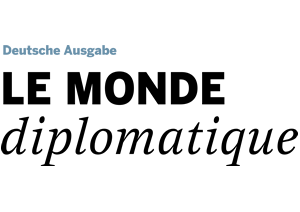 Environment and Planning A: Economy and Space, 47(6): 1313–1331.